NIGERIA Incentive-Based Risk Sharing System for Agricultural Lending Plc (NIRSAL), a subsidiary of the Central Bank of Nigeria (CBN) has revealed that Nigerians spends a total of about N25 billion on foods daily most of which are imported from other countries. NIRSAL said a total of about USD623 million is spent annually on catfish importation into Nigeria through smuggling, a country said to have about 71.2 million cultivable hectares of land where only about 34.2 million hectare are currently cultivated. With this revelation, it means agriculture sector of the economy can employ 65 percent of Nigerian populace. If the government decided to go into agriculture with full force, it then means banks will either sink or float depending on their preparedness. Speaking at the Day-two of a 3-Day Agricultural Value Chain Financing (AgVCF) training Workshop organized for Bankers in Kaduna, Executive Director, NIRSAL plc, Mr. Arowosafe Jide, said the training became necessary due to distrust between the farmers and lending banks to finance agriculture projects which is part of the reason for over dependence on importation of what the country could actually produced if all professionals in agric value chain can be sensitized and understand their expected roles especially now that government is shifting it’s attention from oil and gas into agriculture. because of lack of trust between them and famers with a view to key into agricultural agenda of present administration under the leadership of President Mohammadu Bulgari. The report by NIRSAL revealed that Nigeria loses about USD623 million Dairy importation, USD500 million on sugar importation, USD 4 billion spent on wheat importation, USD2. 2billion on cotton importation and USD2 billion on Rice smuggling importation annually. 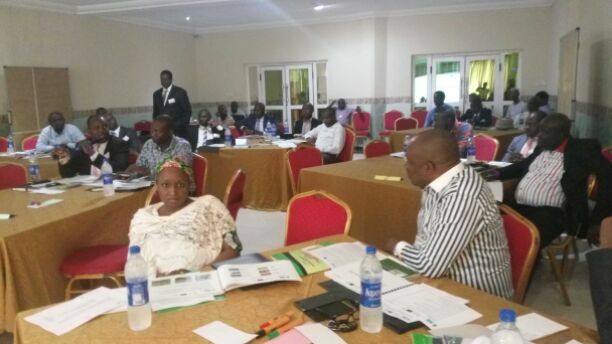 A participant, Regional Director with UBA Bank, Mr Danjuma Salihu, said his Bank has been agricultural friendly adding that they are aware of the risk inherent in agric lending and how to mitigate them, adding that the training had further boost their knowledge on loan disbursement to farmers with farming calendar. “They make us understand that they have been able to train N40, 000 local farmers both retail and commercial. As Bankers, they brought us here to strengthen our relationship with farmers on Financing Agricultural Value Chain. The participants noted that now that the government is serious with diversification of economy, the CBN must ensure that they monitor all that eventually got the money to see that such money is not diverted doe other use because of the risk involved.